That brings the total to 36 companies that have pulled their support from Beck or given explicit instructions that their ads are not to run on the show. It’s all because more than 160,000 ColorOfChange members connected the dots for Glenn Beck’s advertisers and called on them to stop supporting his show. We want to say thank you to everyone who’s participated in this campaign. We could also use your help. We brought on additional staff for the campaign in order to drive as many advertisers away as possible. We need to keep them in order to maximize the number of advertisers that drop Beck and to make sure none come back. Anything you can provide will help us get there — whether $10, $20, $50, or more. You can make a contribution to help move the campaign forward, here. After we first launched this campaign, our staff began contacting advertisers to convey the concerns of our members and ask advertisers to stop supporting Beck. Most advertisers decided to do the right thing after hearing about what Beck is doing, and that so many people are concerned about it. Some needed evidence of the level of outrage, so we flooded with comments from people that signed the petition to advertisers. Others needed a picture of what it would look like for their company’s name and brand to be publicly associated with Beck’s rhetoric, so we showed them that, too. Then there were those that refused to answer our calls or respond to our emails. Red Lobster, Vonage, Clorox, Lowe’s, and Experian fell into that category, and we asked some of our members to give them a call. By the end of last week, ColorOfChange members made more than 2,800 calls to those five companies, and in just two days, three out of the five — Experian, Clorox, and Lowe’s — pulled their ads. We’re still waiting to hear if Red Lobster or Vonage have changed their minds, and we’ll follow up with them this week. “…I wanted to let you know that we have taken steps to make sure that [Sprint] will not be advertising on the Glenn Beck show,” Dunleavy later reiterated in a phone message to ColorOfChange.org. “While we will continue to advertise on news programming, including FOX News, there are certain programs on the FOX Network that do not meet Lowe’s advertising guidelines, including The O’Reilly Factor and Glenn Beck Program,” said Meliski Cox, a spokesperson for Lowe’s, in an email to ColorOfChange.org. In a phone conversation with ColorOfChange.org, a spokesperson for AT&T, Daryl Evans, said that their company already had Beck’s program on a ‘Do Not Air’ list for their ads, and if an advertisement was seen during ‘Glenn Beck’ it was placed in error. Evans pledged to call Fox News and correct that error. In a phone conversation with ColorOfChange.org, Marcy Smith, Director of Advertising for Experian Consumer Direct, confirmed that due to the number and frequency of complaints they have received, they have specifically asked Fox News to pull any of their ads from Glenn Beck’s program and distribute their ads to other shows in the rotation. “We hear your concerns and are no longer advertising on the Glenn Beck show,” said Cindy Thomas, Chief Marketing Officer for Ditech, in a phone message to ColorOfChange.org. “What we did last Thursday was our advertising department requested of Fox News Channel that they no longer place a portion of our ads on the Glenn Beck Program [sic],” said a spokesperson for Farmers Insurance Group in a phone message to ColorOfChange.org. “Just want to let you know that we will no longer be advertising on that [Glenn Beck’s] program,” said David Silver, a spokesperson for The Elations Company. We are dedicated to moving this effort forward, and we’ll be calling on you to help–whether it’s making focused calls to other advertisers, signing another petition, or doing some other action that will get us closer to exposing what Beck represents and marginalizing his voice. Today, though, financial support is what we need most. A contribution from you — whether $5, $10, $20, or more — will help us maintain the staff we’ve brought on to help with this effort. We know that for some folks it’s a hard time to give, but if there’s any possibility you can make a donation, please do so. This is a time we can really use your support, and it will help us keep the pressure on. And to a large extent, this is a Pyrrhic victory- while the advertisers pulled their ads from Beck’s show, they still continue to appear on Fox. Hey- I know you have to start somewhere, but Beck’s views are reinforced and reiterated on a number of others- Limbaugh, O’Reilly, etc. I agree with Jon, but then no matter what happens to Beck and the other right wing nuts, they still don’t have the “herding cats” problem that we liberals have. No liberal radio host will ever have thousands of DITTO heads. Jon – Beck and others place themselves on the alter as ‘high priests’ – this shows what he would look like if he was in fact some other religio-fanatic, plus it’s funny. What you’re saying is ‘2 wrongs don’t make a right’ – well, we’re not wrong! LOL. Anna, the boycott was not against FOZ News (maybe it should be) – it was against Glenn Beck. So, this shows a very positive development. C’mon, now, take the good news with the bad. 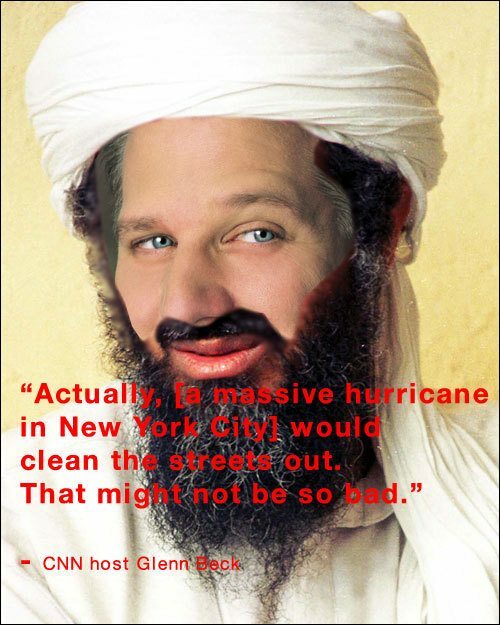 I just watched Keith Olbermann on Glenn Beck – Olbermann called him Mullah Beck due to his latest rants. That is very cool! Beck is freakin spooky, and I love Olbermann for not being afraid of any of em. People mention Oreily alot, but Hannity is even more vile! Hit whereever it hurts! As far as “Fixed” news………to go against them… fine…. but I think it’s even better to hit each one in name. Not so much that “two wrongs don’t make a right.” I guess I’m just trying to be objective. If I were a moderate republican or independent who came across that picture, I might not see the humor. Instead I might view it as hypocritical. Then I would probably pay less attention to the story and dismiss it as “left-wing radical spin.” I think Becks whacko-facsist beliefs and outright lies speak for themselves. Personally, I think it’s funny, and justified because he is such a bad person(in my opinion). But if we want to do more than just preach to the choir, we might need to try different tactics than the right wing town-hall-tea-bag sect is using. By the way, tea-bagging is for nuts. Who the heck eats at Red Lobster? Oh…probably the same dumb asses that listen to Beck and think he’s a genius. I sort of feel sorry for all of those ignorant people who buy into all the fear, hate & lies of air bags like Beck, Limbaugh, O’Reilly, Hannity, Dr. Laura and so on. Those pundits are not only in love with the sound of their own voices, but they also know exactly how to pander to the sheep who will blindly follow their doctrines of intolerance, while they laugh all the way to the bank. Better than getting a real job, right guys? On the flip side, it’s sure easy to see why America now ranks #18 in education. Beck’s a freakin’ Mormon for Christ sakes! That cult is just plain WACK!!! Fox News is a machine for pushing public discourse in America farther and farther to the right. Fox News, as a whole, is the proper target for the boycott. It is not simply about whipping up fervor amongst the least educated and impressionable people on the right. It is about year after year of a concerted campaign to make the most outrageous right wing garbage become “mainstream”. That is why progressives must organize and find effective methods to push back. In this country, we today cannot even have a rational public media discussion about the various forms of public health care systems in dozens of other countries, because propaganda machines like Fox News have made it easier for all the other big corporate news outfits to demonize progressive proposals and programs. “Socialized” and “socialism” are not bad words. Medicare is not the devil. Neither are public roads and public libraries. Progressives must wake up and confront the consicous, programmatic efforts of the Right, to chip away and roll back progressive reforms on every level. DEMAND SINGLE PAYER PUBLIC HEALTH CARE! DO NOT BE CONTENT TO CAMPAIGN FOR ACCEPTANCE OF A “PUBLIC OPTION” COMPROMISE!